The poll workers at Pinedale on election day 2016 couldn’t remember the last time a news reporter had visited their community in the southwestern corner of Union County. Voting is done at the Pinedale Volunteer Fire Department and Community Center, which is 14.7 miles from the Union County Courthouse. They could feel a little isolated out that way, but on the other hand, being remote from the seat of power of the County of Union may be what they like most. The election workers were hospitable, but not at all excited over having their picture made and posted on an internet news site. 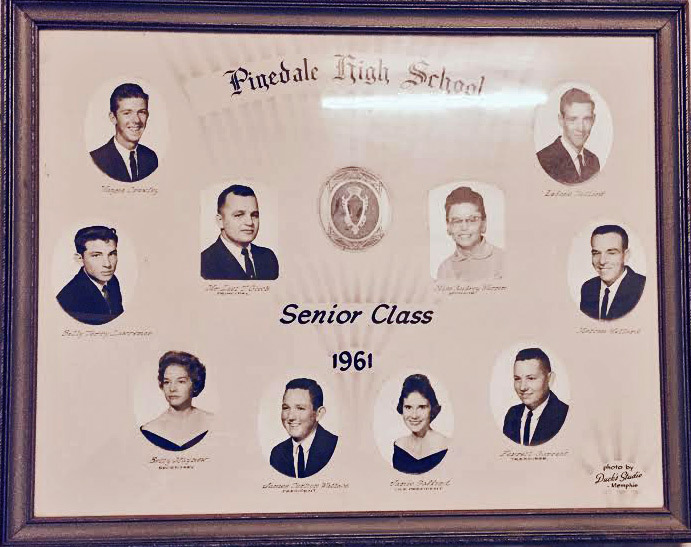 On the wall of the voting room hang composite photographs of several graduating classes of Pinedale High School. The last class pictured was from 1961, when the eight graduates that year were: Wayne Crawley, Billy Terry Lawrence, Betty Mayhew, James Carlton Wallace, Janie Gafford, Ferrell Garrett, Melvin Willard, and Ladene Dillard. The class sponsor was Miss Audrey Warren and the Principal was Mr. Lael T. Gooch. Pinedale is still, 55 years after they received their diplomas, a nice community with neatly kept houses, a very low crime rate, and respect for God and country. By the way, Pinedale voted 290 for Trump (91.19%); 22 votes for Clinton (6.92%). New Albany, MS- Here are a few scenes from the wide-flung voting precincts of Union Couty, along with information on turn out at the time of the photo. NAnewsweb.com will update this post periodically throughout the evening with additional photos and, when polls close, with local returns. West Union: with a 49.5 percent turnout (374 of 756) at 4:18 pm.